The King, and The King of Acoustic Steel String Guitars. Four years before the birth of Elvis Aaron Presley, C.F. Martin & Company created a body template for the acoustic steel string guitar which would prove to be the single most successful template for such an instrument ever created. To this very day, so many years later, the Martin D-28 is the most copied design of steel string guitar in the world. Elvis Presley was a genre busting music and film star who was the ultimate symbol of pop culture in the USA from the time discovered by Sun Records until the time he died on August 16, year of our Lord 1977. 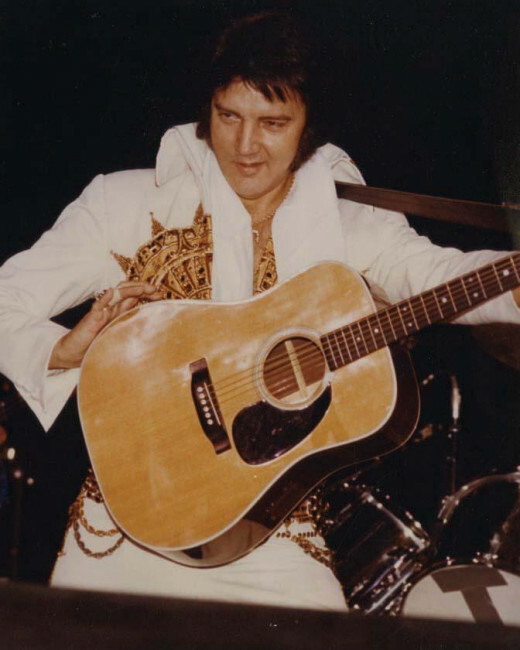 There are two distinctly different Martin D-28s made as Elvis Presley models. If you were to ask or enter the question into Google or another prominent search engine, "what guitar did Elvis Presley play?" Well, you'd get a lot of answers. Let's be honest about this, Elvis was a worldly man with a lot of money, and he played whatever damned guitar he wanted to play. 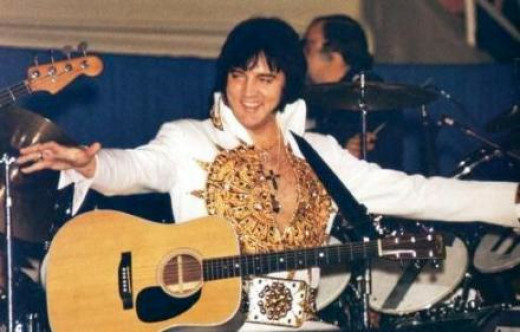 No doubt about it, Elvis had lots of guitars. He'd been photographed and recorded with lots of guitars, and most of them were either Martin guitars or Gibson guitars. It would be many years later the other great American guitar manufacturers other than Fender really became so well known and prominent in the pop or popular rock genres. This is important, and I want the reader to realize this straight away, there's not just one exact Martin D-28 Elvis Presley model guitar out there. There's more than one, Martin has created more than one issuing of very different sorts of guitars with Elvis Presley's name on it; but make no mistake, these guitars are ALL collectible, and they are all based on the D-28 format of steel string acoustic dreadnought guitar. Some of these Elvis Presley D-28 guitars by Martin are far more ornate and feature more woodworking and decoration than other issues do, likely, the ones with the less work done on them have more utility for the actual player. If your desire is to have a guitar to show people, get the most decked out with engraving, inlay, and binding and signatures instrument you can find; but if you are more an actual guitar player, you want the guitar that sounds and plays the best to your personal style of playing. The Martin D-28EP, a replica of the 1972 D-28 owned by Elvis Presley. Now be it known there is a .pdf document available for your perusal should you choose to download it from the official C.F. Martin & Company website, and you can absolutely get that document right here. The .pdf is for the D-28 modeled after the 1972 D-28 Elvis owned and played, the other instrument, a copy of the 1955 model which has all the engraving on the top isn't an instrument I would think anyone serious about making music themselves would or even should want to own - unless they just wanted to own it to hang it on a wall and show it to people or something like that. The soundboard of an acoustic guitar is the single most important thing such a musical instrument, and one doesn't go engraving things on it should one want to make actual music with the thing, for this reason I'm not interested in the replicas of the 1955 Elvis owned D-28, and I don't think you should be either. The replicas of the 1972 D-28 which wasn't tampered with so horribly is the guitar I'm going to be discussing from here on out exclusively on this article - as it IS an instrument which is both beautiful and well suited to making great music with. I also think it important that I make clear and the reader understands this is NOT a replica in any way of the famous pre-world war two Martin D-28 guitars, this is a replica of a 1972 D-28, and that is a different guitar altogether for several reasons. Like I said, the most important part of an acoustic guitar is the top of it, the soundboard. This guitar is a VERY interesting guitar, and the single most interesting thing about it, in my opinion, is the wood used for the soundboard, and it is Carpathian spruce. This is the only guitar I am currently familiar with which uses that particular variety of spruce, and you can rest assured there is something tonally different in the wood from other varieties of spruce. 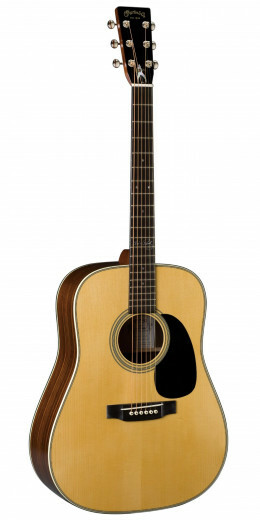 Most modern D-28's are of Sitka spruce tops, but for about one to two thousand dollars more, you can get one with Adirondack spruce in the form of either the D-28GE, or the D-28 Marquis. It's very important the prospective buyer of this instrument understands the bracing pattern on this guitar is not like the ones used before the second world war, and is also not like the ones used on more modern D-28's either, this is not a herringbone trim instrument at all, and neither is it a "high x" braced instrument, as the herringbone trim as a rule is used on the "high x" instruments. This guitar will sound different from those forward shifted X braced or "high x" guitars. The rest of the specifications are as follows, and I'm pricing these on the web for about $4,000 dollars.